How long do gas grills last? How to clean your gas grill? Does a gas grill need to heat up? 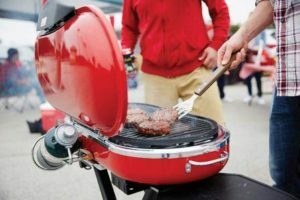 Whether you’re a grilling master or an apprentice griller that doesn’t know a spatula from a skewer, I’m here to tell you about the top rated gas grills under 300 dollars. 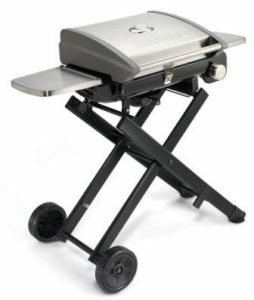 Two burners, three, or four, I’m going to give you the information for you to decide on which one of the best gas grills under 300$ is for you. I have you covered no matter if you plan on serving four, or forty. Are you interested in a side burner? Or maybe you would like some storage underneath that grilling machine. Perhaps you’re short on space and need a smaller grill with side tables that collapse when not in use. Or maybe you like the extra room to slice and dice, or prep some tasty piece of grillable goodness. Not to mention some extremely portable units for the culinary genius on the go. Take your BBQ skills on the road with you. Now I’ve done the research for you. Look no farther. Here are eleven of the best gas grills for under $300. Now let’s get down to the good, the bad, and the greasy. Not in the order of from best to worst. 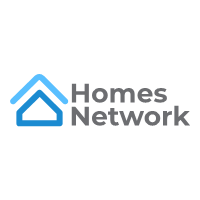 Just the information for you to decide what works best for you, in your back yard, or on your patio, or deck. This is a top rated grill for under 300. It delivers a warm 24,000 BTU’s of heat for your meat or your vegetables. A 300 square inch cooking area on two porcelain-coated, rust-resistant, non-stick, cast iron grates. It features an electronic sparking ignition, and convenient fold-down side shelves for extra work space, or just fold down to conserve space. The storage area with a door provides access to the propane tank while hiding it at the same time. It sits on four casters- two of which lock. And measures 42.9” wide by 24.5” deep, and 44” high. Great grill for a small family, but if you plan on entertaining you might want to choose something larger. Char-Broil has been around since 1948 and has always been one of America’s favorite brand of grills. 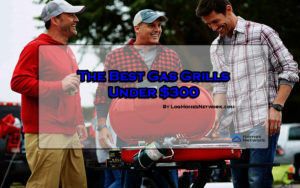 And also why you will see a couple of models from this manufacturer, on this list of the best gas grills under $300. 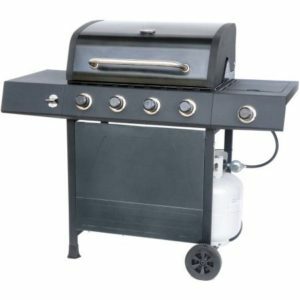 And the Char-Broil Performance 475 4-Burner Cart Liquid Propane Gas Grill, is no exception when it comes to great gas grills. With 475 square inches of primary cooking space and a convenient side burner, you can easily cook twenty burgers and your favorite side dish or sauce. Four stainless top-ported burners are durable for longer lasting performance and offer great temperature control. These burners are built to last and deliver 36,000 BTU’s of heat. Perfect for the family or entertaining a few guests. The swing away warming rack provides another 175 square inches of cooking or warming area. This is a cart style grill sitting on two stationary legs, and two 7 inch wheels, for easy mobility. The Char-Griller 3-Burner Grillin’ Pro Propane Gas Grill is another top rated gas grill for under $300. The 3001 Grillin’ Pro has a whopping 40,800 BTU’s. And the side burner offers another 12,000 BTU’s. It’s made from durable steel and powder coated for years in the outdoors. Add a custom fit cover for even longer life. It weighs less than 100 pounds and is easy to move around the yard. 630 square inches of cooking space makes this one of the largest and the best gas grills under $300. This gas grill also has a convenient side shelf for added workspace and a perfect prepping area. Electric starter for quick and easy lighting, and no waiting to warm up before you throw that king-sized steak on there. The large 49 inches, by 28 inches, by 49 inches makes this perfect for some backyard grillin’ with the ability to entertain a few friends or family. Your food never tasted so good. You could ask if everyone wasn’t so busy stuffing their faces with that gourmet masterpiece that you just created. The Royal Gourmet ZH3003 Dual 3-Burner Gas and Charcoal Grill Combo, gives you the best of both grilling worlds. If you don’t have time to get that charcoal going, try the instant ignition lighting of the three stainless steel burners totaling 24,000 BTU’s of heat. 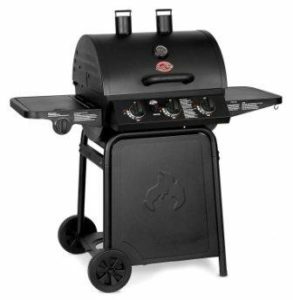 The charcoal side is equipped with an adjustable cooking grate to control the heat and give you that great charcoal flavor that’s hard to get with propane gas. I love that you can use charcoal or gas. Or use them both and invite some people over for dinner. I personally enjoy the taste of food cooked over charcoal more. But with the busy rush of life and work, I need the quick heat of the LP side to have dinner ready for my family, with minimal waiting time. The assembled 64”L x 28”W x 49.75H gives you enough room for 32 burgers and a 12,000 BTU side burner with cover, for some more food. This is one of my favorites. A great price for this size of the grill makes this one of the best grills under $300. Are you a guy always on the go? Do need a grill that’s more mobile for your tailgating or camping needs? Maybe a quick set up to feed your hunting buddies and help keep them warm while out in the elements. When I think of being outdoors and great equipment, I can’t help but think of Coleman. Now from one of the biggest names of all time, when it comes to outdoor equipment, Coleman brings you the RoadTrip LXE Propane Gas Grill. At 51.2 pounds this thing is easy to take wherever you may need to grill. Great for the beach, or for the park, or if you just need a little more cooking space for your daughter’s back yard sweet sixteen parties. Those girls won’t eat the meat your grilling anyway, but that’s ok, your using a top rated gas grill for under $300. Just fold it up and roll it to your favorite grilling destination. Then just lift and lock into place. When you’re ready, just press the button to ignite the InstaStart matchless lighting system. Cook for an hour on one propane tank with 20,000 BTU’s of power on 285 square inches of cooking surface. When you’re done, let it cool. And then when you’re ready to go, it folds down small enough to fit into most car trunks. The Dyna-Glo DGB390BNP-D Smart Space Living 3 Burner LP Gas Grill is the next level of performance. This is the durable, high-performance cooking system that friends and family will gather around for years to come. And your neighbors will surely be jealous when they see this gas grill. With a great track record of long-lasting equipment, it’s easy to see why grill masters everywhere consistently rate these grills above the rest. The Dyna-powered cooking system features a porcelain enameled steel firebox that houses three stainless steel burners, with 36,000 BTU’s of scorching heat. All of this gives you fast consistent heat over 503 square inches of cooking area. The compact design and collapsible side tables make it ideal for small patios and area limited on space. Additional features include utensil hooks, a towel bar, and a single door cabinet with a “tank seat” propane storage area. You can also purchase separately, a custom fit cover, to keep your grill protected from the elements. It’s a great idea to keep your grill in great shape for years to come. With exceptional performance and convenient portability, the Cuisinart All Foods Roll-Away gas grill is a great choice for the serious back yard griller or the chef on the go. The versatile design and perfect 240 square inches of grilling space, full size height, and fold away side shelves, make it ideal for backyard get-togethers and everyday grilling. Also, the roll-away folding cart makes it easy to pack and transport everywhere and anywhere. You don’t have to sacrifice grill quality when you travel anymore. Take this grill with you to any campground, tailgate, or beach. It comes with a reliable twist-start ignition system for instant lighting. The precise temperature gauge displays the internal temperature of the grill. And the heat distribution panel executes even temperatures across the entire grilling surface. Well built culinary tools are the Cuisinart signature. And this masterpiece is no exception and easily one of the best gas grills for under $300. 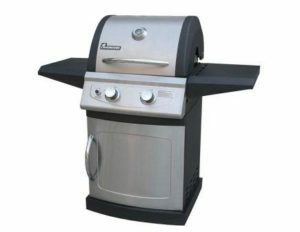 The Cuisinart CGG-7400 4-Burner Gas Grill is the home dwellers back yard dream. This is Cuisinart’s first full-sized gas grill. It’s built to impress and designed to last. Complete with four individually controlled stainless steel burners and up to 40,000 BTU’s of cooking power, for maximum cooking control. Plenty of cooking space on almost 610 total square inches. An easy twist to start ignition and removable cooking grates mean it’s easy to clean and was made with the consumer in mind. Comes complete with two 18-inch x 13-inch side tables for your prepping needs. Built-in thermometer for the perfect monitoring and maintaining of that even heat distribution. And one of the best features that all backyard grillers can appreciate, a built-in bottle opener. Open a beer or your favorite beverage while smelling that delicious food cooking. And at 72 pounds this gas grill is easy to move wherever it’s needed. Great quality with a great brand name. When it comes to cooking, you can’t go wrong with Cuisinart. 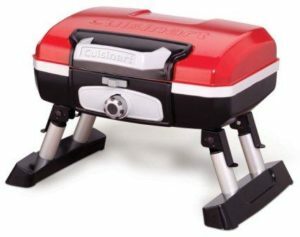 The ultimate in portable grills, the Cuisinart CGG-180T Petit Gourmet Tabletop Gas Grill, is just that. This compact, high-performance grill can be placed almost anywhere. Although small, it’s big enough for most family meals – 8 steaks, 8 burgers, 6-10 chicken breasts, or over 4 pounds of fish. This grill heats very quickly and uses much less gas than the full-size versions. So portable you can cook anywhere you go – the beach, the game, the campsite, boat, or even the bed of your truck. Folding legs, lid latch, carry handle and spill resistant drip tray, equally enhance the portability. This grill is perfect for the construction worker traveling for their job. Tired of spending money on eating out? This grill would pay for itself in a very short time. Take it to the job site or leave it at the hotel, your coworkers will be instantly jealous. Take the world famous Cuisinart brand everywhere with their line of outdoor grilling products. Everyone will be impressed with this fine grill purchase and your culinary talents. Start making them envious today. 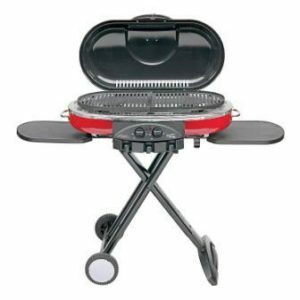 The Landmann 42202 Falcon 2-Burner LP Gas Grill with folding shelves is comparable to the first grill we reviewed. It is a combination of black powder coating and stainless steel. 30,000 BTU’s and 2 tubular stainless steel burners, delivers perfect heat to 479 square cooking inches. 49.8 x 24.5 x 45.8 inches total dimension. 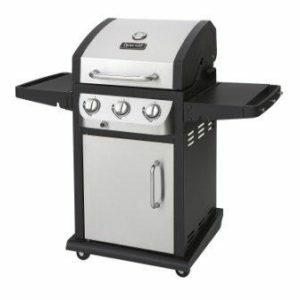 One of the best gas grills under 300$, but it does require two AA batteries for the ignition switch. It’s a rather impressive grill with just a small footprint. 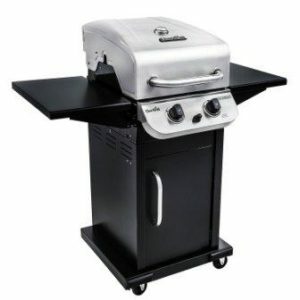 And last, but not possibly least, is the RevoAce 4-Burner LP Gas Grill with Side Burner. Perfect for food, fun, family, and friends, whether cooking for a couple or a crowd. It features 480 square inches of primary cooking area, with an additional 180 square inches of warming area. Includes a convenient side burner for sauces and sides. The four individually controlled 12,000 BTU burners spark up with integrated ignition providing ultimate BBQ control. 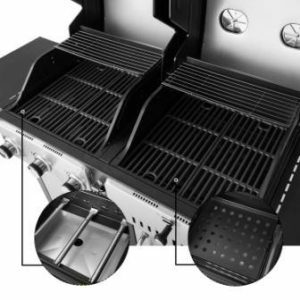 This grill can easily be converted to natural gas by purchasing the optional Versifuel valve and connecting it to your homes outside natural gas connection. The cart also paneled to hide that unsightly LP tank. This is a beautiful grill, sure to get the neighbors attention. 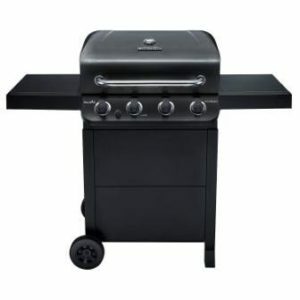 The last of our top rated gas grills under 300. First, you need to know your available space for your new gas grill. Once that’s decided you should think about how many people you regularly cook for. Do you have occasional BBQ’s, hosting lots of people, and need more cooking space at times? You also need to be aware of combustible materials around your grill area. Will you be using LP or natural gas? Will you be traveling with your grill? Is it easy to clean? Also if your grill is going to sit outside, you may want to look into a stainless steel model or purchasing a cover for your new gas grill. It doesn’t always have to be about the size of your grill. Buy what works best for your needs. Good gas grills will normally last 5-10 years unless seriously neglected. Burners will usually need replaced once within the lifespan of the grill. Those can usually be purchased online. If cleaned often and covered, or if your grill is kept inside, your new gas grill could last up to 15 years. As with anything, the better you care for your grill the longer it will last. Turn off the gas supply knob on the tank or the natural gas valve. Remember “righty-tighty, lefty-loosey” to close and open valves. Carefully remove grates and scrub them with a soft wire brush and soapy water. Soaking in a hot water, dish soap solution for a bit will help loosen the baked-on food deposits. Investing in a grill brush for easy cleaning will save you tons of time when cleaning. It’s also nice to scrape or wire brush the grates between uses. Be sure to clean both sides of the grates. Remove the metal plates or burner covers and scrub them clean. Soaking will benefit you here as well. Gently wipe off the burners and poke the small holes in the burners with a toothpick to clean and get a more even flame. Scrape any charred drippings from the bottom grill surface, and clean with soapy water. Check the sides and underneath side of the lid and clean if necessary. Scrape away any loose food or paint chips. These can fall on your food and ruin a fine and tasty slab of meat. Replace removed items in the reverse order, and turn on the gas. Light the grill with the built-in igniter and lower lid. Let your grill burn for 15 minutes to burn off any remaining soap and debris. Turn off the gas and you’re ready for your next BBQ. The first thing is that you want to do is lift the lid. By leaving the lid closed and turning the gas on you take the risk of building up fumes and blowing up your new gas grill. Turn on the LP gas at the tank. Make sure your grill is open and turn on the burners you want to light. Turn the appropriate knobs to the highest setting, and spark the igniter. Once the grill is lit, turn down the heat to the proper grilling temperature for the food you’re cooking. When the food is cooked thoroughly, turn off the burners, and then turn off the valve on the tank. Let the grill cool completely before you attempt to move or cover it up. Follow these instructions and enjoy many years of grilling experiences. When you’re ready to cook, so is your gas grill. No preheating of your new gas grill is necessary. It is ready for food immediately after lighting, and adjusting the heat. You may need to adjust the temperature occasionally until you get used to cooking on your new grill. And always keep water nearby for flare-ups. Please be careful I wish you success in your grilling endeavors. 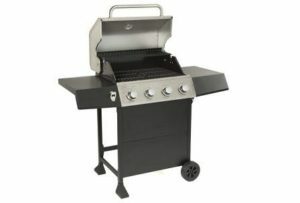 The primary causes of gas grill fires involving structures included the following: failure to clean the grill (24 percent); placing the grill too close to combustibles (15 percent); leaving the grill unattended (15percent); a leak or break in the gas line (14 percent); and using the grill for warming (7 percent). Please be careful and take care of your grill. Grilling should be a fun and bonding experience and not a trip to the ER. So examine your surroundings, and read the manual that comes with your top rated grill under 300 dollars. And be safe, your current or future grilling ace. You’re family, and friends are counting on it. 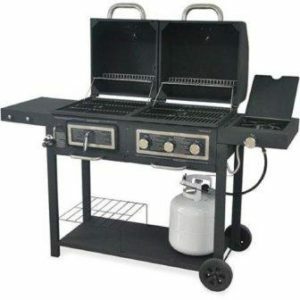 These are all fine examples of top rated gas grills under 300. I hope that you now have the right information to decide on which grill works best in your backyard, on your patio, or deck. From compact and portable to having the capacity to feed the masses. If you have limited space, there are several models with fold-down side tables to choose from. Stainless or powder coated options are available for your aesthetic pleasure. Definitely make sure to go back and check out the three super compact and portable versions that I have reviewed. You may just have to purchase two grills. One for your home, and one you can take with you wherever you want to go. We have taken the serious griller into consideration as well as the novice buying their first grill. I have tried to pre-answer any questions you might have. I want your grilling journey to be educated and safe. Neither extreme summer heat nor artic winter weather will stop the determined griller. So take the information you have been served, buy one of the best gas grills for under $300, and have it delivered right to your door. I can’t make it much easier than that for you. Grilling out is a great time to bond with your family and friends. Please be safe and enjoy your grilling experience. Life is short, go live it!